Today my brain was on fire with ideas in the kitchen. 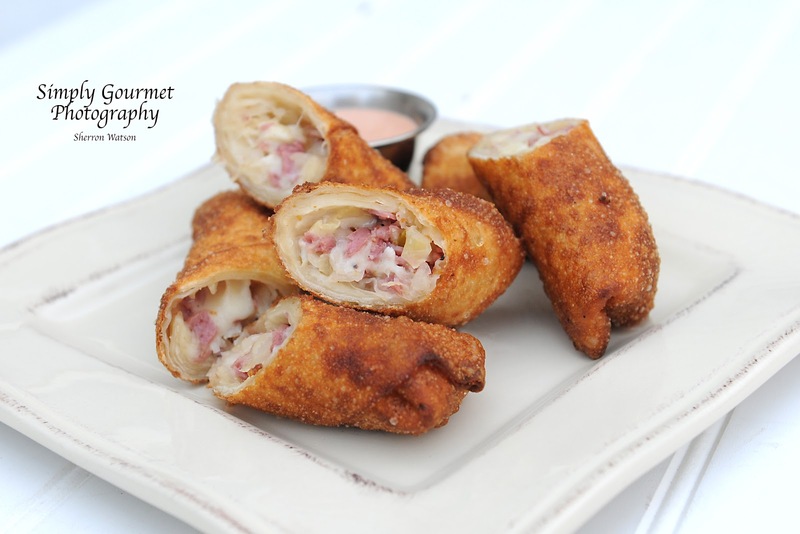 I used the left over chicken filling from our lettuce wraps and made eggrolls and before I knew it…I was making these Rueben Eggrolls. I have been thinking about this for a few weeks now and today I went for it. I am so glad that I did. YUMMILICIOUS! oh my, my family is in heaven. Sometimes our Rueben sandwiches are messy. They drip juice and our fingers and hands are sticky. With these little logs of heaven our hands stayed dry. Happy dance! 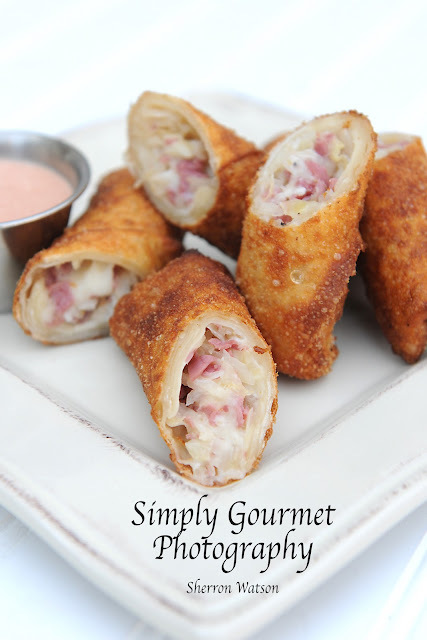 Now don't get me wrong, these will never replace my beloved Rueben sandwich but they are a close second, awesome treat, easy to serve, great appetizer and so tasty good! In a large pot start heating your oil. I put about 2 inches. Bring to a temperature that you can deep fry the eggrolls. I usually test the oil first with a tip of the eggroll, if it starts to bubble then it is ready. Mix equal parts of mayonnaise and ketchup for the sauce. Depending on how many eggrolls you are serving will decide how much to make. While the oil is heating, prepare you mixture. I used 4 pieces of pastrami, diced. If you want more meat, by all means add more. I used 8 slices of provolone, diced. I used 1/2 cup of sauerkraut. Mix together in a bowl. 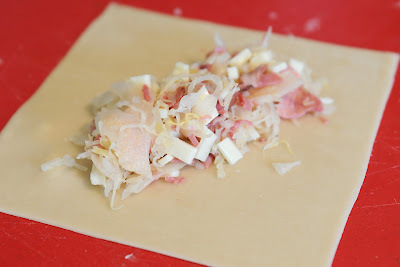 Spread out your eggroll wrapper and put about 3 T. of mixture inside. Fold over one corner, then the sides and roll towards the last corner. 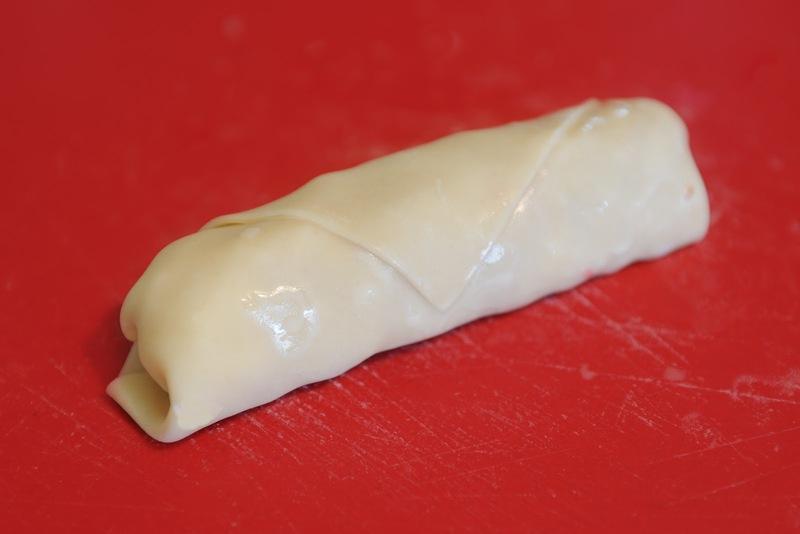 Use water to seal the ends to the eggroll. Fry the eggroll until golden brown. Mine took about 5-6 minutes. You may need turn them half way through so that both sides get browned. Let cool on a wire rack. Cut diagonally and serve with the mayonnaise/ketchup sauce. This looks so good! I love the stuffing idea, sounds very delicious! Thanks Sandra…Next time I will have to make twice as many…they were really good warmed up too. Have a great week! Thanks Hirsita…I will be making these again this weekend…my family LOVED them! Wow, wonderful rolls, love the combo of the crunchy outside and the soft inside! Thank you! They are quite tasty. These DO look good! But I see an error I hope you'll fix: "Corn" beef should be "corned" beef. Whether you post my comment or not, I hope you'll make the correction. Thanks!